The U.S. Department of Labor reports a need for 28,200 (31%) more substance abuse and behavioral disorder counselors between 2012 and 2022. In order to attract enough qualified individuals to meet this demand, the compensation level for AOD/SUD counselors needs to be increased 38 – 40%. 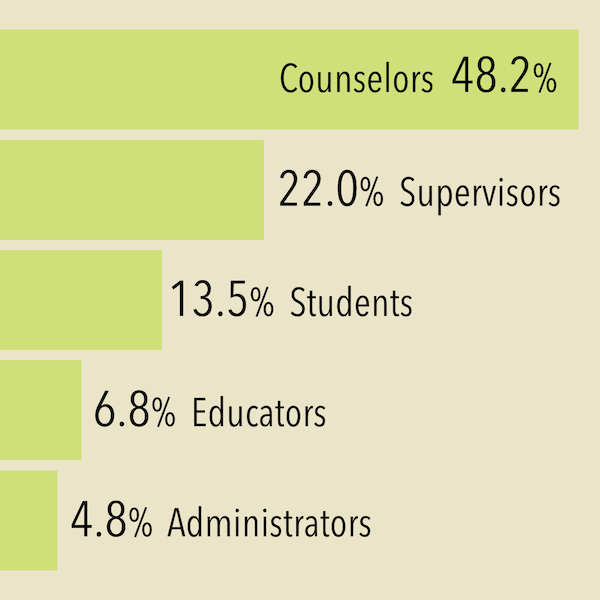 In order to justify increased compensation levels, an AOD/SUD counselor should complete a minimum of at least one full academic year of college, as suggested by 81% of the survey participants, or at least two years as suggested by 54%. The cost of tuition and books in AOD/SUD studies programs can be as high as $20,000, but the typical cost for highly-ranked schools is $2,000 to $4,000. Seek professional certification from an organization that respects and is an advocate for the counselor by requiring adequate formal education and other professionally reasonable standards for certification. Breining Institute conducted a nationwide survey of AOD/SUD counselors, supervisors, licensed healthcare professionals, administrators and educators from throughout the United States, during the months of July and August 2015. 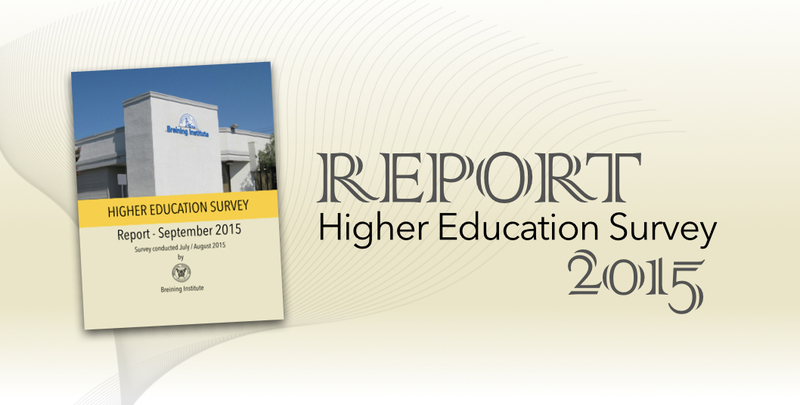 892 individuals from 19 U.S. States participated in this national survey. Survey participants identified and graded 110 institutions of higher learning that provide formal education in addiction studies. Virtually all of the survey participants identified themselves as currently working in the field, or as students preparing to working in the field. 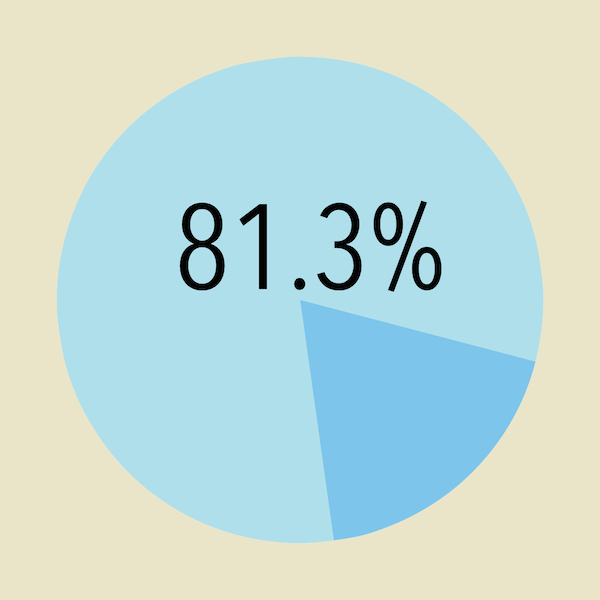 Less than 5% of the participants did not claim a current AOD/SUD professional or student status. 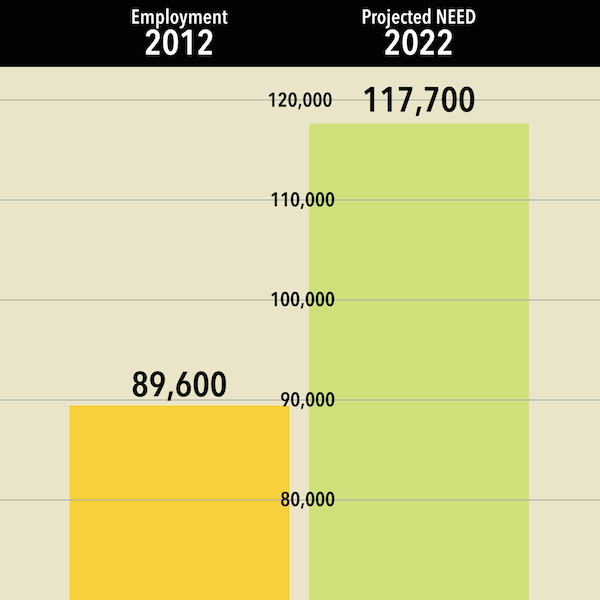 The U.S. Department of Labor reports that there will be a significant increase in the demand for qualified substance abuse and behavioral disorder counselors, a 31% increase between 2012 and 2022, which will require an additional 28,200 counselors. Source: Bureau of Labor Statistics (BLS), U.S. Department of Labor, Occupational Outlook Handbook, 2014-15 Edition, Substance Abuse and Behavioral Disorder Counselors. In order to attract and keep qualified individuals as AOD/SUD counselors, there is a need to increase their compensation levels. A majority (50.8%) of the survey participants cited the compensation level as one of the biggest hurdles that prevent or delay individuals from entering the AOD/SUD profession. 79.4% of the survey participants responded that the average starting pay range for a certified AOD/SUD counselor is currently between $10 and $18 / hour. 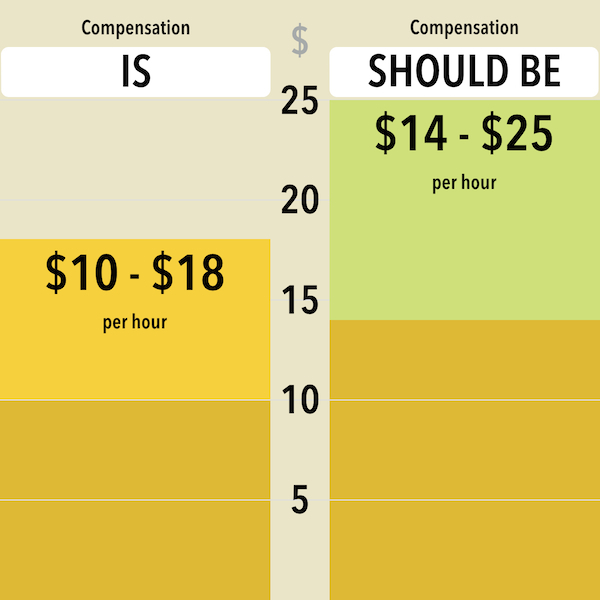 83.1% of the survey participants responded that an appropriate starting pay range should be between $14 and $25 / hour. This represents a 38 – 40% perceived gap between what is and what should be the appropriate level of compensation. However, the $14 – $25 / hour pay scale suggested by the survey participants for AOD/SUD counselors, typically having completed only a high school education and a few post-high school courses, is roughly equal to the BLS-reported $19.95/hour median pay of mental health counselor and marriage and family therapist professionals, which have an entry-level education requirement of a Master’s degree. The important work performed by AOD/SUD professional counselors is, without doubt, extremely critical to clients and their families. However, it is a challenging argument for the individual with a high school diploma and a few post-high school courses to seek compensation levels equivalent to those of other health care professional counselors who have earned Masters degrees. In order to justify an increase in compensation levels, there is need to raise the required level of formal education for AOD/SUD counselors to a minimum of one or two full academic years of college. A substantial majority (81.3%) believes that the minimum formal education for any AOD/SUD counselor should be at least one full academic year of college (a minimum of 30 semester or 45 quarter units of credit). A majority (54.7%) believes that the minimum formal education for any AOD/SUD counselor should be at least two full academic years of college (a minimum of 60 semester or 90 quarter units of credit). The minimal standard of a high school education and completing a few post-high school courses for an AOD/SUD counselor certification has been deemed “obsolete” and outdated by respected authorities, and may be a significant reason that many AOD/SUD counselors are being held back in compensation levels. The minimum education finding is consistent with an informal survey of job postings requiring nearly half of AOD/SUD counselor positions be filled by candidates with college degrees (survey of 505 job positions posted in the 18 months between January 2014 and July 2015 on the Breining Institute Online Job Board). The cost of tuition and books in an AOD/SUD studies program can be as high as $20,000, but the typical cost is $2,000 to $4,000. A majority (55.5%) of survey participants cited the cost of formal education as a significant hurdle that prevent or delay individuals from entering the AOD/SUD counseling profession. 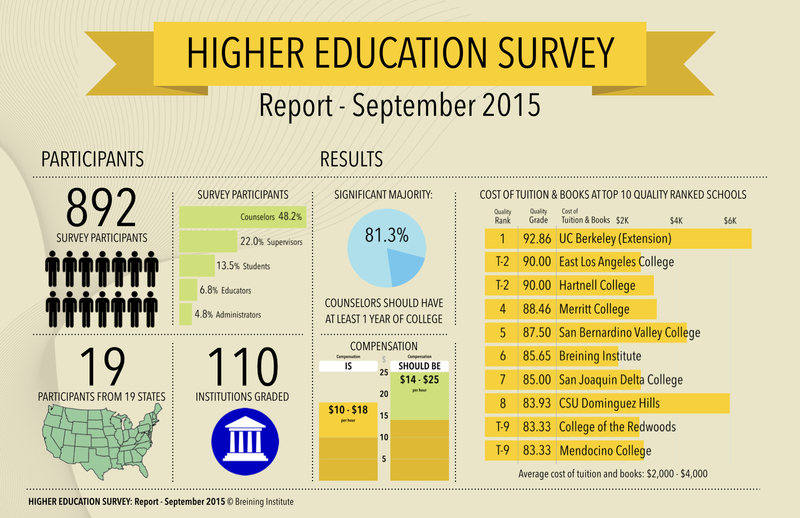 Survey participants reported the cost and evaluated the quality of education offered by 110 institutions located throughout the United States that offer AOD/SUD education. There was a wide range reported of approximately $2,000 to $20,000 to obtain a quality education in entry-level education in alcohol and drug studies. However, the average cost typical for the entire survey group was stated to be in the $2,000 – $4,000 range, with most being less than $6,000. 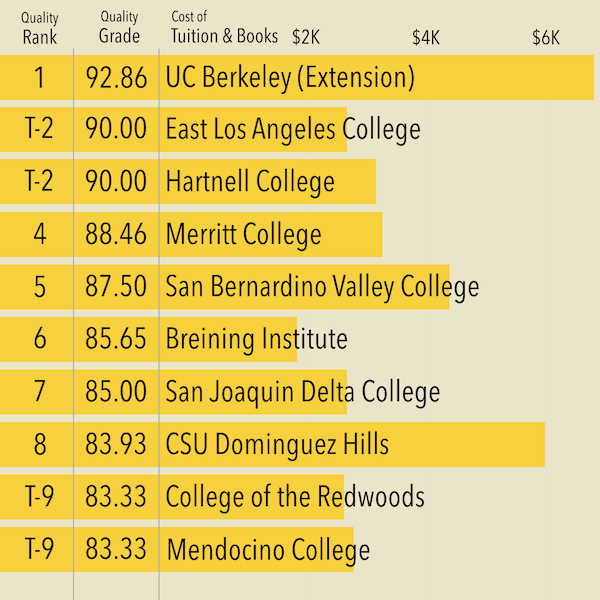 These reported estimates are consistent with the data obtained directly from the Top 10 ranked schools, above, in the order of their Quality Grade (must have been identified and issued a grade by at least five survey participants in order to be ranked). A difference in some of these costs may be attributable to the length of the particular program, so the reader should examine the respective types and extent of credit awarded by these respective institutions in order to obtain an “apples-to-apples” comparison. We wish to express our great appreciation to all of the individuals who took the time to participate in this nationwide survey, providing valuable and insightful comments and observations. Our top priority at Breining Institute, since 1986, has been to provide current and future addiction professionals with exceptional education and training, and we hope that we have met your expectations.